This home is managed by MySanFelipeVacation - your one shop for all your San Felipe vacation rental homes. 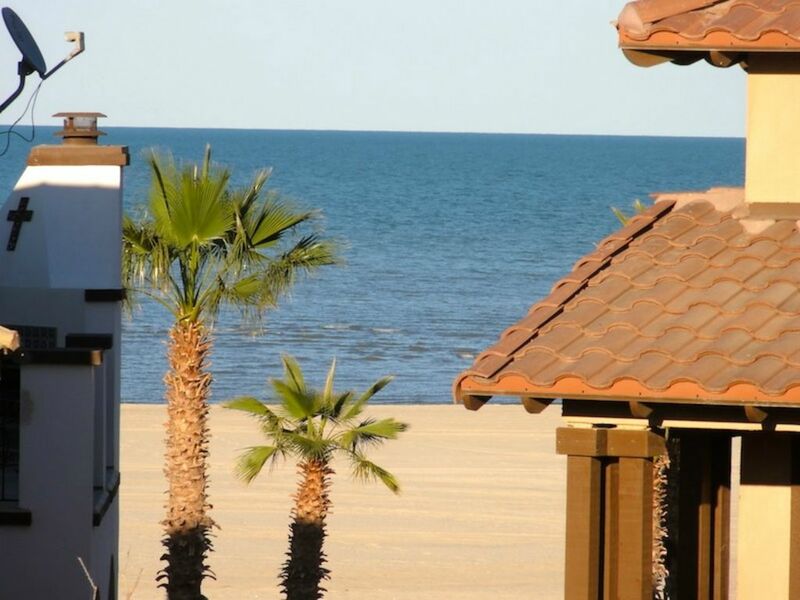 This stunning modern style beachfront tri-level house located with internet in the quiet, upscale resort development of El Dorado Ranch, San Felipe, is a very popular rental and comes with free golf pass. A short walk to our private beach by the Sea of Cortez, this is the beach known for its gentle waves – perfect if you have young kids. The Sun will delight you at sunrise as you watch it tango over the calm sea. This villa is fully furnished and features, high ceiling, travertine floors throughout the house, 2 king size bedrooms and a sky lounge on the 3rd floor. There is a bedroom on each floor. A master bedroom on the ground floor with king size bed sleeping 2 guests. The mattress is super comfy and duvet are European design. The master bedroom has a walk-in closet and full bathroom with his and her sink, shower and bathtub. A 2nd master bedroom on second floor comes with 2 queen beds, sleeps 4 guests and also has a separate full bath. The second opens to a balcony with sea views. The spacious sky lounge has been converted to a 3rd bedroom and comes with a queen bed to sleep 2 guests. Sky lounge features a separate bathroom. 6 guests can comfortably sleep in this villa. Views from every room. The beach facing living room has a fireplace and flat screen TV with satellite hook up. As you come out the front door from the living room, you will find a semi-shaded patio with bistro chairs. Head out through from the patio and you will find yourself in the warm beach in just a few steps. The kitchen with stainless steel appliance and granite counter tops is located on the ground floor. A good-sized kitchen island makes preparing meals fun and a popular hangout spot in the house. With an attached two-car garage, there is plenty of space to park vehicles, ATVs and other toys securely. Not that you need to worry about security in San Felipe, but our resort is gated and comes with 24-hour security. This home is managed by MySanFelipeVacation - your one stop for all your San Felipe vacation rental homes.